Whisk corn starch with 3tbsp of milk in a small bowl, set aside. Combine coconut milk, heavy cream, remaining milk and sugar in a heavy bottomed sauce pan. Heat on medium flame, stirring constantly until sugar melts. Bring the mixture to a boil. Lower the heat and slowly add the corn starch mixture in a steady stream, whisk continuously. Cook stirring continuously until the mixture thickens, about 3 minutes. Turn off the heat and add ground cardamom. Let cool, then refrigerate for at least 4 hours. Follow ice cream machine directions and churn the ice cream. 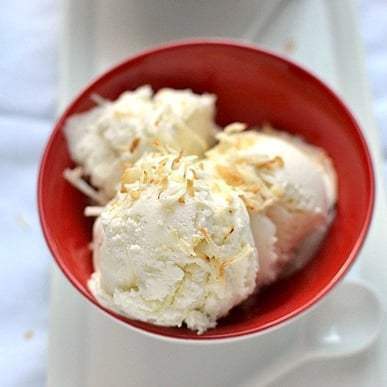 Enjoy with toasted coconut sprinkled on top! !